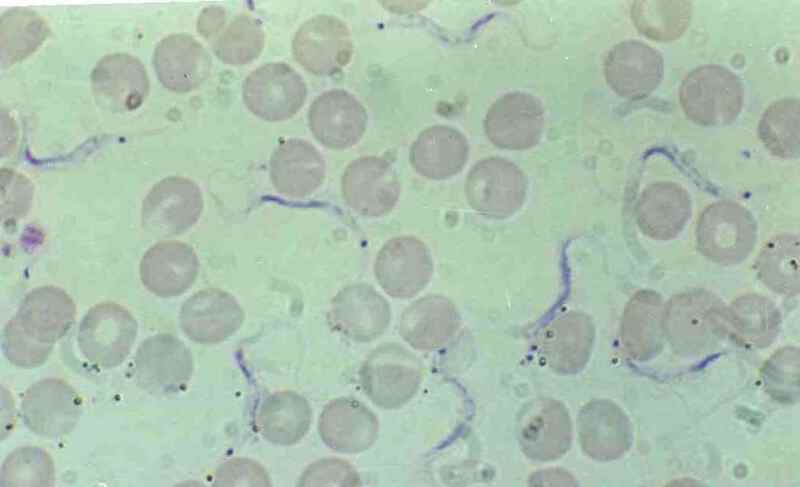 Trypanosoma (Herpetosoma) lewisi is a trypanosome of the sub-genus Herpetosoma (Stercoraria section), parasite of rats (Rattus rattus and Rattus norvegicus) transmitted by fleas. T. lewisi has a stringent species specificity and cannot grow in other rodents such as mice. Rats are infected principally by oral route, through contamination by flea faeces or ingestion of fleas. Trypanosoma lewisi infections in rat colonies can interfere with research protocols and fleas of wild rats are often the source of such infections. Currently, diagnosis of T. lewisi in rats is performed by microscopic observation of stained blood smears. In the course of a research project at CIRDES, a T. lewisi infection was detected in the rat colony. In this study we evaluated PCR primer sets for their ability to diagnose multiple species of trypanosomes with a single amplification. We show that the use of ITS1 sequence of ribosomal DNA provides an efficient and sensitive assay for detection and identification of T. lewisi infection in rats and recommend the use of this assay for monitoring of T. lewisi infections in rat colonies. Trypanosoma (Herpetosoma) lewisi was first reported by Kent in 1880 and subsequently by Laveran and Mesnil in 1901. It is a trypanosome of the sub-genus Herpetosoma (Stercoraria section). A parasite of rats (Rattus rattus and Rattus norvegicus), that is transmitted by fleas: Nosopsyllus fasciatus, in temperate countries, and Xenopsylla cheopis in inter-tropical areas . T. lewisi can also develop in Ctenocephalides canis (dog flea), Leptopsylla segnis (mouse flea) and Pulex irritans (human flea) which can act as reservoirs . As T. lewisi is specific to rats, it cannot grow in mice. Rats are infected principally by oral route, through contamination by flea faeces or ingestion of fleas . Some Herpetosoma, like the mouse trypanosome Trypanosoma musculi, have a similar strict host specificity, but others, like Trypanosoma rangeli, can infect a wide range of hosts . All trypanosomes of the sub-genus Herpetosoma are non-pathogenic to their vertebrate host, it has even been reported that rats infected by T. lewisi, and mice infected by T. musculi have a quicker growth-rate and reach a heavier weight than those which are not infected . However, it has been suggested that infection of rats by T. lewisi can increase their sensitivity to other parasites . We have found that serial passages from mixed infections of rats with T. vivax and T. lewisi leads to the apparent elimination of T. vivax over 5 passages (unpublished data). Obviously, in using rat models to research trypanosomosis, it is important to confirm that rats used are free of infection with other trypanosomes such as T. lewisi. Since morphological discrimination can be problematic, a molecular test to discriminate between Trypanosoma species is therefore desirable. In the course of a research project aimed at developing primers for the detection and identification of livestock trypanosomes, which were directed at the ITS1 of the ribosomal DNA, a set of intermediary primers proved to be especially sensitive for detection of T. lewisi. The PCR products from T. lewisi were sequenced and compared with the sequences obtained using the same primer set from other Trypanosoma species. Serial passages of a T. vivax isolate (TVFG1)  were initiated in irradiated wistar rats by intra-peritoneal route. Once the parasitaemia reached 107 parasites/ml of blood, 0.5 ml of blood were inoculated to another rat. Once the infection by T. lewisi had been detected, to check the level of infection of the rat colony, 25 four months of age rats were randomly selected from the colony; 20 of them were irradiated, and all of them were then bled daily for microscopic observation of parasites. 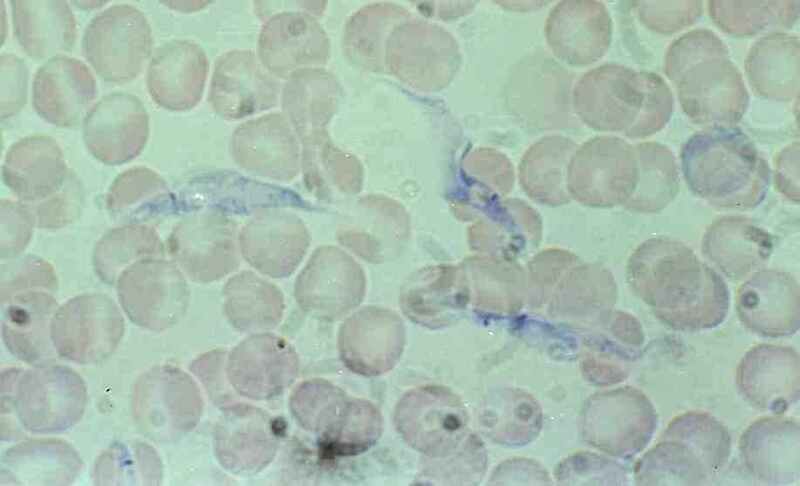 Identification of the trypanosomes was performed by microscopic observation of fresh rat blood and stained blood smears. Identification was based on the morphological features of the parasites described by Hoare . Sample DNA was prepared from rat buffy-coats as previously described . PCR were carried out in 11 μl reaction mixture containing 10 mM Tris-HCl pH 8.3, 50 mM KCl, 1.5 mM MgCl2, 200 μM each of the 4 desoxyribonucleotide triphosphates (dNTPs), 1 μM of each primer, 0.25 unit of Taq polymerase (Appligen), 5% final DMSO, and 1 μl of DNA template. Primer sequences were as follows: TRYP1R: 5'GGA AGC CAA GTC ATC CAT CG 3' (20 mer, GC 55%, MT: 62.9°C), and TRYP1S: 5'CGT CCC TGC CAT TTG TAC ACA C 3' (22 mer, GC 54.5%, MT: 64.7°C). As previously described  KIN primers were also used for amplification of ITS1, and IR primers for ITS1-2. PCR cycling were: Initial denaturation of the samples at 94°C for 2 min, followed by 35 cycles of 30 sec at 94°C, 30 sec at 55°C and 30 sec at 72°C, with a final extension at 72°C for 10 min. 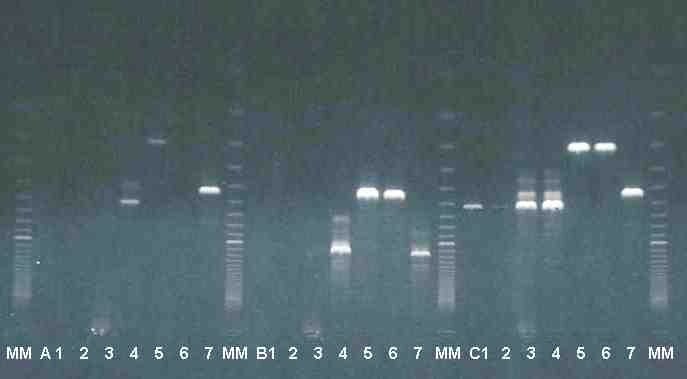 PCR products were observed on a 2% agarose gel stained with ethidium bromide and photographed under ultra-violet light. PCR products were purified using Wizard DNA Clean Up System (Promega Corporation, Madison, WI, USA). PCR purified fragments were cloned into pGEM-T Easy Vector (Promega Corporation). Three clones of each cloned PCR product were sequenced by the method described by Sanger et al, using the T7 primer and the Big Dye Terminator Cycle Sequencing Ready Reaction Kit (PE Applied Biosystems, Foster City, CA, USA). Sequences were analysed on a PE Applied Biosystems 310 automatic DNA sequencer (PE Applied Biosystems). ITS1 sequences obtained with T. lewisi and T. vivax were compared between themselves and with the data available on Genbank, using the clustal V software . T. vivax (TVFG1) was observed during the first 5 passages, but T. lewisi also appeared during these passages. In subsequent passages, T. vivax disappeared and only T. lewisi remained. The parasitaemias observed were very high (> 107 parasites/ml of blood). Screening of the colony for eventual infection by T. lewisi did not show parasites in the 5 normal rats under observation. In irradiated rats, T. lewisi were detectable in most of the animals (16/20) between 5–14 days after irradiation, showing a severe infection of the rat colony. In fresh preparations, the adult form of T. lewisi can dash through the microscopic field, as classically described for T. vivax, but at a higher speed. The posterior end of the parasite is very thin, long and rigid, which clearly differentiates it from T. vivax. 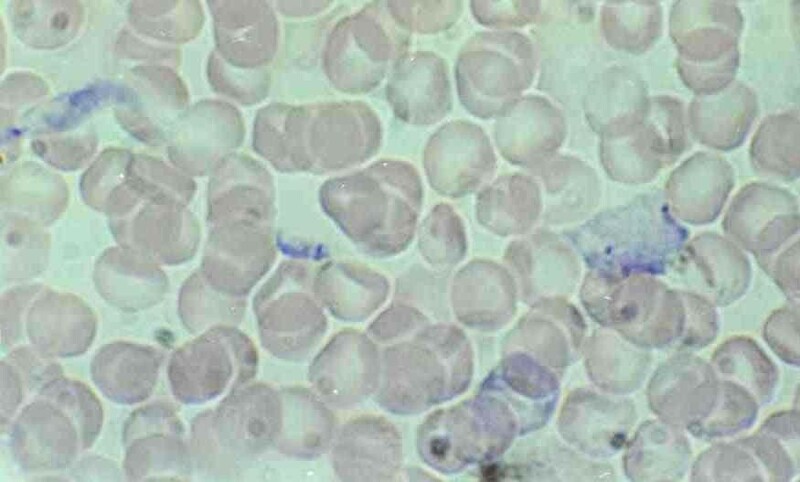 A better distinction is given by the microscopic observation of Giemsa stained blood smears, where the parasites appear as described by Hoare . Depending on the incubation period, parasites appeared as classical adults slender forms (fig 1 &5), or, as immature forms (fig 2, 3 &4). Trypanosoma lewisi (left) and Trypanosoma vivax (right) adult blood forms. Left: Trypanosoma lewisi has a long thin posterior end, with a sub terminal ovale kinetoplast, the nucleus is in the anterior part of the body, part of the flagellum is free; Right: Trypanosoma vivax has a round posterior end, with a terminal round kinetoplast, the nucleus is in the medium part of the body (dividing form on the right of the picture); part of the flagellum is free. Trypanosoma lewisi, adult forms before or after division in rat blood. Ovale kinetoplast transversal to the body clearly visible. 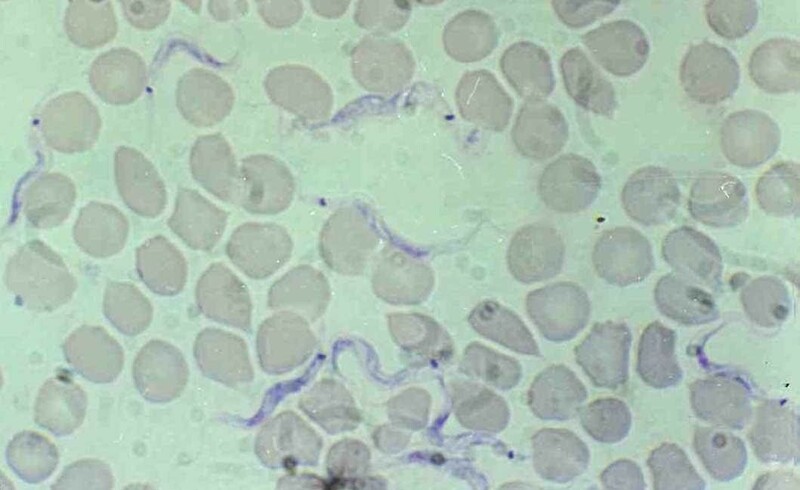 Trypanosoma lewisi, intermediate forms in rat blood. Intermediate form with migration of the kinetoplast, large and granular body. Trypanosoma lewisi, dividing epimastigote and amastigote forms in rat blood. Dividing epimastigote form with large body and 2 kinetoplasts and amastigote form resulting from division. In adult forms, it is noticeable that the thin straight posterior end of the parasite retains very few stains and may not be clearly visible. Over-staining can help to make it more visible. The nucleus is anterior, the kinetoplast is far from the posterior extremity, which is very sharp and thin and the kinetoplast is oval, placed transversally to the body (fig 2 &5). The adult form is monomorphic, and can easily be distinguished from Trypanosoma vivax (large and circular kinetoplast situated at the round posterior end of the body, nucleus in central position) (fig 1). Immature forms offer several morphological features: epimastigote, binary dividing epimastigote (fig 3 &4), multiple-dividing epimastigote; at this stages the stain is well retained by the cytoplasm and gives a granular aspect to the body which can be very large and contain several nuclei (fig 2 &4); amastigote (fig 4), and trypomastigote (fig 5) . In early passages, when T. vivax and T. lewisi were both present in rat blood, two PCR products were visible as previously shown with KIN primers . In further passages, the specific product of T. vivax disappeared. With primers TRYP1R and TRYP1S, a 623 bp product was obtained with T. lewisi. The length of this product clearly differentiates T. lewisi from T. brucei, which gave a 520 bp, T. vivax (310 bp) (fig 6) and the T. congolense types (between 680–750 bp; data not shown). TRYP1S and TRYP1R can detect and identify as well the other livestock trypanosomes, with the same level of specificity as that described for KIN primers . Amplification of rDNA ITS with three sets of primers specific for kinetoplastids: A : KIN1 and KIN2  (ITS1), B : IR1 and IR2  (ITS1-2), and C : TRYP1R and TRYP1S (original primers) (ITS1), with DNA of T. lewisi (from 4 different rat buffy-coats 1, 2, 3, 4) T. vivax (5, 6) and T. brucei (7). MM = molecular marker Super ladder 100®, bands are in 100 bp increments, 100 bp band is visible as the topmost band. Sequence of the ITS1 of Trypanosoma lewisi (421 basis) and the product amplified by TRYP1S & TRYP1R (623 basis). Sequence of TRYP1S and Reverse sequence of TRYP1R (in bold). Sequence of the ITS1 (underlined). The other sets of primers for kinetoplastids gave visible products in some instances, but with a much lower sensitivity and reproducibility than TRYP1R & TRYP1S (fig 6, lines A and B). A serial dilution of a DNA sample indicated that T. lewisi DNA was detected as low as 5 pg with TRYP1 primers, against 15 ng with KIN primers and 375 ng with IR primers. The sequence obtained is presented in figure 7. The straight primer (TRYP1S) is located in the 18S gene while the reverse one (TRYP1R) is located in the 5.8 S gene. Sequences indicated before and after the TRYP1 primers were obtained by sequencing of the product amplified by IR and KIN primers (primers for amplification of both ITS1 and 2). The length of the product amplified by TRYP1R & TRYP1S is 623 basis, while the length of the ITS1 is 421 basis (fig 7). Alignment of the ITS1 sequences obtained in T. lewisi and T. vivax or T. brucei was not possible since size and sequences are completely different. Comparisons of the ITS1 sequence of T. lewisi with data available in Genbank® show no significant homology with the ITS1 sequences of Crithidia and Leishmania sp. nor with the available sequences of Trypanosoma sp. (T. vivax, T. brucei, etc). Observation of 5 normal rats randomly selected from the colony did not show the presence of T. lewisi. It has been described that natural infection of rats by T. lewisi provokes a high parasitaemia (prepatent period of about 6 days) followed by a moderated parasitaemia (for several weeks), but later, parasites are hardly detectable in the blood, until they completely disappear (self-cure). As shown by the irradiation of 20 non-injected rats, most of the animals from the colony were already infected at the age of 4 months. Elimination of the adult rats, insecticide treatments, and restarting of the colony from breeding stocks born after the insecticide treatments were necessary to clear the rat colony from trypanosome infection. The most probable source of contamination of the colony is fleas from wild rats naturally infected. It is noticeable that the microscopic observation of fresh preparation can cause some confusion, since T. lewisi can dash through the microscopic field, as classically described for T. vivax, but at a higher speed. In the adult form, the posterior end of the parasite is very thin, long and rigid, which is clearly different from T. vivax. Immature forms are not very uniform and can also be confused with atypical forms of a T. vivax during rapid proliferation. Identification must be performed by examination of stained blood smears prepared daily from the same rat, to allow the observation of all life cycle stages of the parasite, until the typical adult form appears. The ITS1 amplified in T. lewisi (421 basis) is clearly different in length and sequence from that amplified with T. vivax (114 basis). Some non-specific products were observed in the excess of DNA (fig 6, lines C3-C4), but these products were no longer visible in further dilutions of T. lewisi DNA samples (data not shown). Alignment of the ITS1 sequences obtained in T. lewisi and T. vivax is not possible since size and sequences are completely different. ITS1 is usually variable in size and sequence; this characteristic served as a basis for molecular differential diagnosis [5, 6]. Several works have been reported on the minicircle kinetoplast DNA of Trypanosoma lewisi[10–12] and some showed differences with Crithidia sp. , but they did not end at a PCR identification of the parasite. In the present work we described for the first time the sequence of the ITS1 of T. lewisi, and a couple of primers that are able to detect and identify T. lewisi. This new test could be a very useful approach on the monitoring of T. lewisi infection in rat colonies. Species specific primers could be designed based on the ITS1 sequence presently published. Desquesnes M. carried out culture of trypanosomes, microscopic identification and photographs, primer design, PCR, and drafted the manuscript. Ravel S. and Cuny G. carried out the sequencing, sequence analysis, and alignment of sequences. All authors read and approved the final manuscript.